Futurama Business Park was the first building constructed in the Czech Republic to be awarded the unique BREEAM international certification. 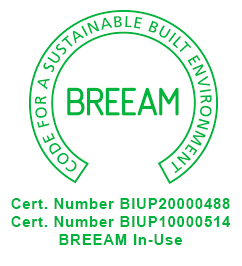 BREEAM (Building Research Establishment Environmental Assessment Method) is the world's leading sustainability assessment method for buildings. The sophisticated assessment system comprehensively evaluates properties with a view to the impact of its implementation and operation on the environment and sustainable development. Evaluation focuses on such aspects as environmentally friendly construction, economical operation of the buildings, environmentally friendly use of the site, the materials used in construction and other environmental aspects such as tenant recycling and green-purchasing disciplines.